Troutman’s Dry Goods is the greater Louisville area’s leader in quality workwear and boots. With a knowledgeable customer service team who treats you like family and a great selection of apparel marked at an unbeatable prices, we’ve been committed to serving the people of Kentuckiana since opening in 1961. Located just 10 minutes from the Fern Valley Exit on I 65, we are centrally located to Louisville. We can be accessed from Elizabethtown or Bardstown in less than 30 minutes. Our customers have exclusively shopped with us for ten, twenty, even fifty-five years. Come see why our customers drive from all over the state to shop our store year after year, pledging their loyalty to us over the industry’s corporate giants. Keen is a relative newcomer in the work boot industry – started as a hiking sandal, they quickly advanced to take over the safety “hiker” style of work boot. 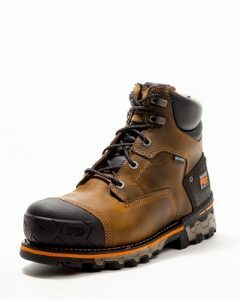 With their large asymmetrical toe box, they’re a great durable work boot for most environments. 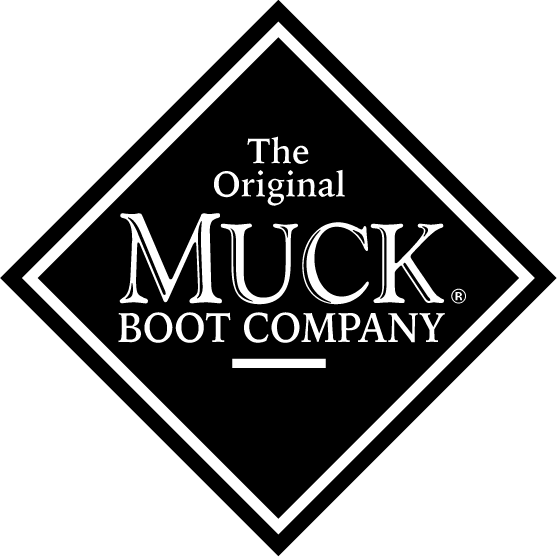 We offer a full assortment of men’s rubber boots from Muck Boot and Lacrosse, the industry leaders in work and outdoor rubber boots. We have rock bottom prices on the Muck, under $120 for the popular Wetland style and carry a full range of safety toe Mucks and Lacrosse. Wrangler: We carry the essential “cowboy cut” western work jean that has remained a staple for over 50 years, we also include both slim and relaxed of the very popular wrangler retro for 39.99! Our seasonal assortment of wrangler snap shirts rotates so please check by! 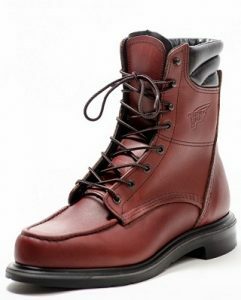 Red Wing and Thorogood are manufactured in America. Thorogood uses union labor and has quickly became our best-selling American made boot. We feature the popular wedge styles in lace up and pull on styles in both safety toe and plain toe. With our 10% discount for union members, our prices for most wedge styles are around $150.00, well below average. Red Wing and Thorogood are manufactured in America, Thorogood uses union labor and has quickly became our best-selling American made boot. We feature the popular wedge styles in lace up and pull on styles in both safety toe and plain toe. With our 10% discount for union members, our prices for most wedge styles are around $150.00, well below average. Carhartt is the number one selling brand of workwear in America, and we have a full two floors of it. Large varieties of pants and jackets are what we pride ourselves on – at prices that are generally 20 to 30% less than our competitors. We carry 1000’s of K87, “the Carhartt t-shirt.” We sell them in long sleeve, short sleeve, Henley, and offer the new performance wicking force series. Carhartt continues to innovate every year with advanced technology and current styles. Rest assured, we have the newest styles in the most popular colors in sizes small through 4x with talls from large through 3x. 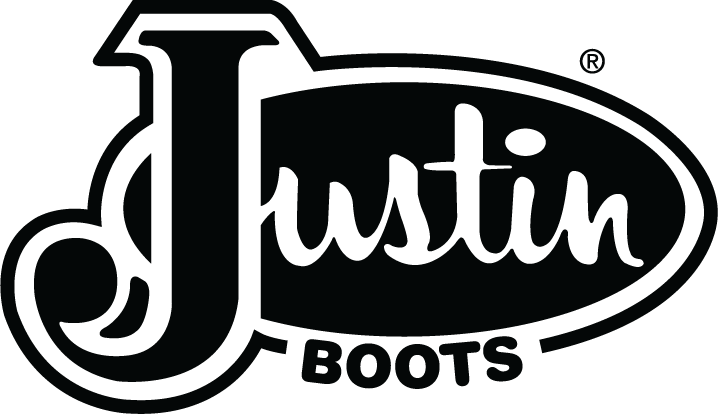 We carry a full selection of American made Justin work boots, along with assorted western styles. We specialize in the jmax and double comfort styles in both pull on and laceup. Timberland is our top selling safety shoe, well regarded for their comfort and generous warranty (most boots offer a 30-day unconditional comfort guarantee). We carry all their best sellers such as the Titan, Helix, Boondock, Eurohiker, Endurance, and anti-fatigue series. 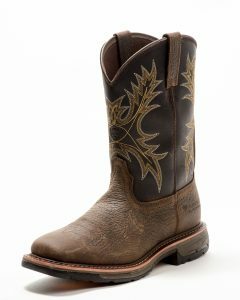 Ariat is the industry leader in western and work western boots and apparel. 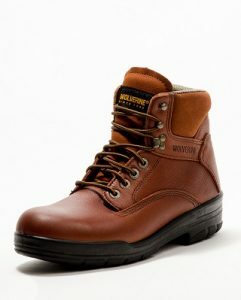 Started as strictly a western company, they now sell just as many “work” boots as they do western. Ariat is our top selling “wellington” style work boot; the square toes are very popular and we carry over 20 styles of the square toe and many more of the round. We specialize in carrying their closeout apparel, including shirts and jeans that are nearly 50% off retail. 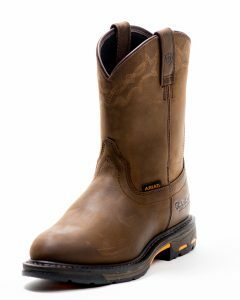 We have many Ariat styles (50+), including the popular workhog, intrepid, venttek, mastergrip and many more. A very stylish Ariat, with a durable duratread outsole that is rubber but mimics the look of a traditional leather sole – without the durability and slip issues that real leather entails. Performance and handsome style meet, with a striking stitch pattern and performance features. 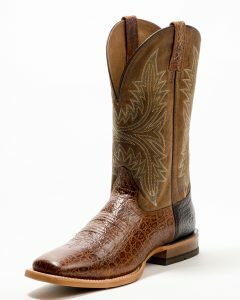 Ariat’s most comfortable western square toe, more flexible than before with a superior ATS pro insole. A durable duratread outsole that’s caramel color looks just like leather but wears and feels much better. 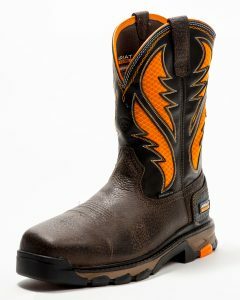 Ariat’s top selling western work boot with composite toe and a waterproof liner. 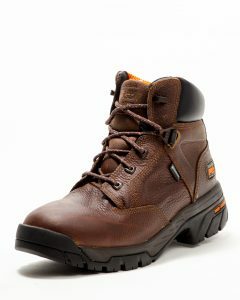 Our top selling model of the square toe workhogs, all day comfort, and durable enough for the toughest industrial jobs. Available in non safety and composite toe. Show off your patriotism with the super comfortable Durango Rebel! The foot and trim are made from oiled, dark brown full-grain leather. 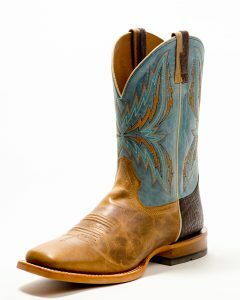 The square toe adds a very traditional flair to this Western boot. 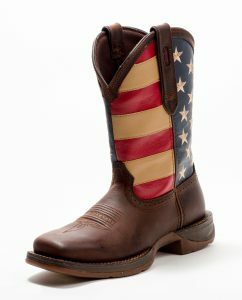 Yet, the focal point of this boot is the shaft, which proudly displays the American flag. We carry full size runs in men, women and kids so the whole family can match! 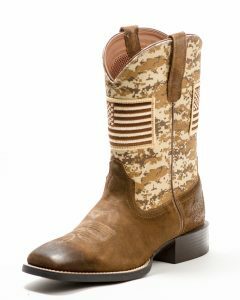 Proudly American made, this is one of our most durable western boots that you can work or go out in. 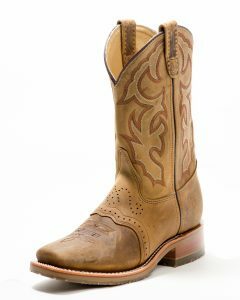 We carry a wide selection of Double H boots, including a round toe version of this boot in a traditional western style. Both of these come in steel toe and non safety toe. 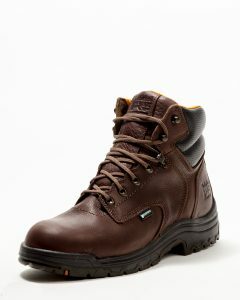 Also stocked in the workhog outsole in steeltoe and nonsafety toe. Athletic styling gives these men’s Timberland PRO® work shoes modern style. Alloy safety toes, breathable mesh linings, static-dissipative performance and anti-fatigue technology come together for the ultimate in low-profile comfort and protection. 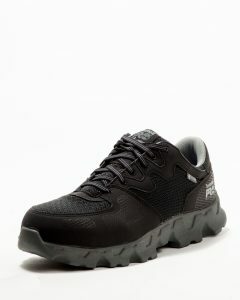 Along with our light weight Reebok Sublite these are our best selling athletic style safety toe. The Timberland Titan came out 20 years ago and revolutionized the work boot industry with never before seen comfort and nearly no break in. They come with a 30 days comfort guarantee to take the stress off of purchasing. Available in soft toe and steel toe. Our Timberland PRO® Helix work boots: The ultimate in lightweight comfort. These boots combine our proven TiTAN® last and exclusive anti-fatigue technology to create a leather work boot that’s tailor-made for long hours in tough conditions. A step above the Titan in durability these boots are tough enough for most jobs and provide amazing comfort with the dual layer anti fatigue insert system. Timberland’s toughest work boot, featuring the patented anti-fatigue insole one of the best comfort systems in the industry. The Boondock has a dual density EVA outsole/midsole for all day comfort. It also includes the 30 day comfort guarantee to take the pressure off of the purchase. The durashock that started it all! One of our longest selling boots and for good reason – it’s extremely light and very comfortable. With an essential slip-resistant sole for safety, this Wolverine DuraShocks® work boot is engineered for energy in every step. Rugged, lighter materials to give you protection and comfort without the weight. Direct-attach construction and Dri-lex® lining keep feet dry, with durable yet lightweight support to fight fatigue. Red Wings are long known for being durable and the 402 is no exception. It features the extremely durable supersole outsole with a padded collar and comfortforce insole for added comfort. We carry this in addition to many more Red Wings in both 6 inch and 8 inch height.